I have made a few fall pick ups last week, but I am still waiting on the right weather to wear them. In lieu of a review I will share my latest acquisitions. My thinking is that this may inspire some of you out there to try something new this autumn or to fill that hole in your cool weather wardrobe before the cool turns ice cold. First, I grabbed a pair of Lands’ End 10 wale cords in the tailored fit. I mentioned these in the my last cord post(Quick Cord Roundup). I have had issues with both the tailored fit and the quality of their cords, but with constant LE Sales they were purchased for cheap. On top of that LE has a great return policy so the risk is minimal. Purchase number 2 is from LE as well. It is a Harrington style jacket often referred to as a Baracuta, because that is the company that produced the iconic jacket. LE calls their jacket a Barracuda and this one comes in Black Watch. My guess is that I will either love it or it will look too neo-prep and I will hate it. The last item that I bought is a pair of pants for casual wear. I don’t like wearing jeans, but sometimes I want to wear something a little more casual than chinos and that is where I hope that this pair of J.Crew 5 pocket cords comes into play. Specifically I purchased the Vintage Cord in the 770 fit (see here). This fit is supposed to trimmer than the 1040 chinos that I wear for work, but not by much. There you have it folks. I am slowly getting ready for fall. I have added a new pair of cords for work to the rotation, added a Harrington jacket in a fun Black Watch patter, and invested in a pair of 5 pocket cords from J.Crew. I will be wearing these as the weather and opportunity allows. More to come in the future. I wear chinos almost everyday. They are a trad staple. They are an important part of my daily uniform as they are for a large portion of the business casual population. Due to this they are always in demand as we will always need a new pair to replace the old, but keeping up on the style, fits, and changes can get overwhelming. Lucky for us Blogger Red Clay Soul has put together a great Chino post (see here). An example of my uniform that includes chinos. Khaki pants will NEVER go away. They are an integral part of the preppy uniform, and they are the go-to for business casual. Pledges love them, and sometimes hate them. After a few years they become disposable (or shorts), but you’ll be hard pressed to find a more comfortable pair of pants after they are broken in. The style(s) of khaki pants live in a spectrum. There are some that would be considered dress khakis, that go with dress shoes and loafers, all the way to more utility khakis that go with boots, and the pants that fit in the middle. He goes on to summarize 12 brands of chinos with which he is familiar. He also segments them by noting which are appropriate for dress shoes and which work with boots. I found this post useful and thought that of all of you would as well. Head over to Red Clay Soul for the full post (see here) and check out a few more of his posts while you are at it. I truly did not think that I would see this day. I have read of it and I have even seen pictures of it, but I still thought it more myth than certain reality and then last week it happened to me. My trusty OCBD that had a charming amount of fraying now has a hole in its collar. 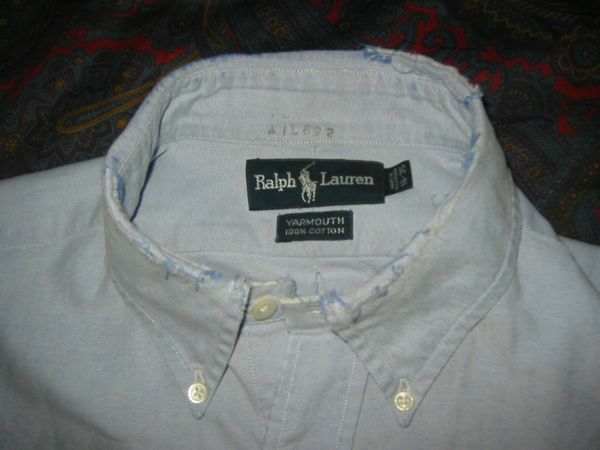 No blog has probably done a better job of documenting the Ivy & Trad virtues of well-worn clothing than Ivy Style with articles such as “A Frayed So: In Praise of Beater Clothes.” It was there where I saw my first OCBD collar riddled (pictured above) with what looked to me like symptoms of an insect problem not true wear and tear. This is where I was wrong. Prior to springing a leak my shirt showed no signs of being on its last leg. It was worn to the office the week before. I put it in the wash frayed and it came out with a hole. It was part of my core rotation of 12 OCBDs. So it sees action about once every other week. I may have worn this one more than others without being aware of it (They do all look the same). However, upon further inspection two others are showing signs of being structurally weak in the same area. I learned a few things this week. I learned that collars do get holes in them naturally without the shirts being worn well past their prime. I also learned that this batch of OCBDs all of which are from Lands’ End were purchased in 2007 and 2008. That is not a bad value at all when you consider that this shirt still has a very long life ahead of it. It may not make it to the office anymore, but it is just starting to get good and I didn’t even have to use sand paper (Princeton Boys and The Sandpapered Shirt Collar). My main watch band was in need of some attention. I say main, because I have worn this band 99% of the time for the last 2 or 3 years. I say it needed attention, because not only was it starting to look dingy but it was also developing its own smell. Luckily for me I remembered reading something somewhere on cleaning watch bands. The somewhere was a menswear forum and the advice was from Ask Andy Trad veteran’s Patrick and Ensiferous. These two suggested soaking watch bands overnight in water with a teaspoon of dishwasher detergent. Last night I gave it a try. I purchased a small bottle of dishwasher detergent at the grocery for $3. I filled a small plastic container with hot water added a teaspoon of the detergent dissolving it before adding in my watchband. This morning I pulled it out of the container, rinsed under tap water, and let it try off. My watch band is not good as new, but it looks and smells so much better! I thought that I may have to throw it away, but it has a lot of life left in it. This is good news to me and this band, but bad news for all of my other watch bands that were hoping to get some playing time.